Pictured is the Pennknoll Village nursing center at 208 Pennknoll Road, Everett, on Tuesday. The property is listed to be sold in the county sheriff’s sales next month, but the operations of the nursing center will not be affected. EVERETT — The property housing the Pennknoll Village nursing center is listed to be sold in next month’s sheriff sales due to a mortgage foreclosure, but corporate management for the nursing facility said it won’t affect the services offered at the center. 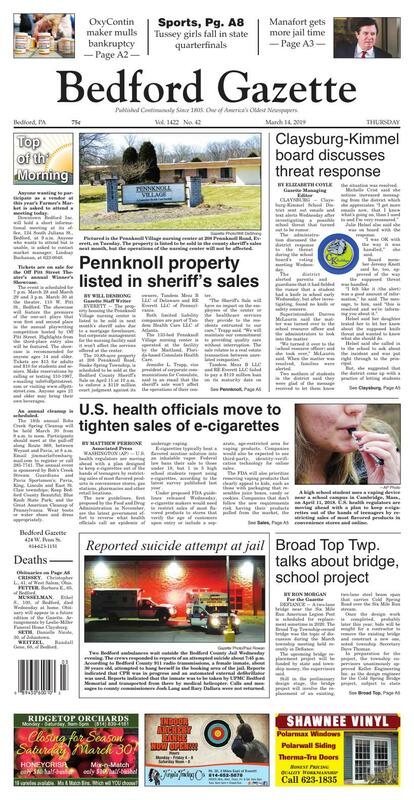 The 10.88-acre property at 208 Pennknoll Road, Snake Spring Township, is scheduled to be sold at the Bedford County Sheriff’s Sale on April 11 at 10 a.m. to enforce a $119 million court judgment against its owners, Tandem Mezz B LLC of Delaware and RE Everett LLC of Pennsylvania. Both limited liability companies are part of Tandem Health Care LLC of Atlanta. The 133-bed Pennknoll Village nursing center is operated at the facility by the Maitland, Florida-based Consulate Health Care. Jennifer L. Trapp, vice president of corporate communications for Consulate, said in an email that the sheriff’s sale won’t affect the operations of their center. Tandem Mezz B LLC and RE Everett LLC failed to pay a $119 million loan on its maturity date on July 30, 2018, according to a complaint filed with the state Supreme Court by FA-SCD SNF Investors LLC of Delaware. A notice of default was sent on Aug. 9. Pennknoll Village is one of seven nursing home properties in Pennsylvania listed in the complaint, all of which are listed in sheriff sales in their respective counties. Other properties are in Washington, Schuylkill, Perry, Luzerne, Snyder and Juniata counties. A subordination, non-disturbance and attornment agreement filed in Bedford County between the investment group and Tandem Mezz B LLC states that the tenant at the property will have the right to continue to operate if the property is sold or foreclosed, as long as the tenant is not in default on its rent. Attorney Clifford Sacalis of Philadelphia, representing the investment group foreclosing on the property, and Francis Crowley of Philadelphia, counsel to RE Everett and Tandem Mezz, did not return messages seeking comment. Two Bedford ambulances wait outside the Bedford County Jail Wednesday evening after responding to reports of an attempted suicide. CLAYSBURG — Claysburg-Kimmel School District sent out emails and text alerts Wednesday after investigating a possible school threat that turned out to be rumor. The administration discussed the district response to the threat during the school board’s voting meeting Wednesday. The district alerted parents and guardians that it had fielded the rumor that a student had a knife in school early Wednesday, but after investigating, found no knife or safety concern. Superintendent Darren McLaurin said the matter was turned over to the school resource officer and the administrators to look into the matter. “We turned it over to the (school resource officer) and she took over,” McLaurin said. When the matter was resolved, families were alerted. Two mothers of students in the district said they were glad of the message received to let them know the situation was resolved. Julie Helsel also said she was on board with the response. “I was OK with the way it was handled,” she said. Board member Jeremy Knott said he, too, approved of the way the supposed threat was handled. Helsel said her daughter texted her to let her know about the supposed knife threat and wanted to know what she should do. Helsel said she called in to the school to ask about the incident and was put right through to the principal. But, she suggested that the district come up with a practice of letting students know when the threat is over that the safety concern has been handled so they know as soon as possible. McLaurin said Helsel’s suggestion warranted an additional consideration for students; that perhaps teachers and staff could inform the students in their classrooms once the situation is resolved. The board also heard about more technology that may be headed for the district in the coming months. McLaurin said district officials met with the Claysburg Education Foundation representatives recently to talk about new equipment for students and staff that may include bionic kits, drones, more 3-D printers, and possibly a digital lathe and/or laser cutter. The district’s STEM curriculum is partnered with the foundation’s annual summer classes that will occur in three sessions. The foundation is sponsoring a 12-day “STEM and the Arts 2019 Program.” The dates are: June 10-13; July 15-18 and July 29-31 and August 1 at Claysburg-Kimmel High School from 9 a.m. until 2 p.m. for students. According to the foundation, the program is coordinated with Claysburg-Kimmel School District. Registration on-line is now open to Claysburg-Kimmel students going into grades 5 through 12. Board member Craig Burket, who provided a legislative report, said the state is looking at addressing vaping among students. McLaurin said there is a “loophole” in the law now that the state may address to make possession of e-cigarettes an offense. Claysburg-Kimmel students now are punished for having one of the devices, he said, but nothing that could be charged as a minor criminal offense. The board also accepted the resignation of Allison McMullen as varsity volleyball coach and the sale of iPads which will be offered to seniors first and then to staff. DEFIANCE — A two-lane bridge near the Six Mile Run American Legion Post is scheduled for replacement sometime in 2020. The Broad Top Township-owned bridge was the topic of discussion during the March township meeting held recently in Defiance. The upcoming bridge replacement project will be funded by state and township money, the supervisors said. Still in the preliminary design stage, the bridge project will involve the replacement of an existing, two-lane steel beam span that carries Cold Spring Road over the Six Mile Run stream. Once the design work is completed, probably later this year, bids will be sought for a contractor to remove the existing bridge and construct a new one, noted township Secretary Dave Thomas. In preparation for the project, the township supervisors unanimously approved Keller Engineering Inc. as the design engineer for the Cold Spring Bridge project, subject to state transportation department review and approval. The supervisors ranked three candidates for the engineering contract. Also, under the roadmaster report, township roadmaster Don Hedge announced as of March 1, the municipality received $206,732 in state liquid fuel and turnback allocation money. Turning to other matters, it was reported that the township is moving ahead with planning for the use of the former Defiance Elementary School. In early February, the township relocated its offices from a nearby building (former Catholic church which once served the Defiance/Six Mile Run area) into the school property with plans to make the structure available for multi-public use purposes. The supervisors continue to work with the Center for Community Action (CCA) in the search for funding to support a proposed senior housing project for the old school. In a related matter, the supervisors thanked a citizen inventory committee for inventorying school items left when the Tussey Mountain School District turned over the school to the township. The supervisors have also set up a meeting with the Bedford County Commissioners to discuss potential use of available school space. In his construction project manager report Hedge Jr. stated that construction on a sewage treatment system is slated for start-up in Sherman Valley, adding that planning for a sewage treatment system for a few properties in the Cypher Beach area is being studied. The projects are being funded through Bedford County Community Development Block Grant monies awarded the township last year. The supervisors also learned that clearing and grubbing continues at an acid mine drainage remediation site just off Route 915/State Game Lands, east of Hopewell with plans in the hopper to open bids for the placement of geo liner materials on the afternoon of Tuesday, April 2. —Reported that an on-lot sewer system along Dudley Road needs repaired noting that if a new filter tank is required, a Part II permit will have to be secured through the state Department of Environmental Protection (DEP). —Heard from a township resident who expressed thanks to the supervisors for keeping the township road in good condition during the winter months. Anyone wanting to participate as a vendor at this year’s Farmer’s Market is asked to attend a meeting today. Downtown Bedford Inc. will hold a short informational meeting at its office, 124 South Juliana St., Bedford, at 9 a.m. Anyone who wants to attend but is unable, is asked to contact market manager, Lindsay Buchanan, at 623-0048. Tickets are on sale for the Off Pitt Street Theater’s annual Winner’s Showcase. The event is scheduled for 7 p.m. March 28 and March 29 and 3 p.m. March 30 at the theater, 110 W. Pitt St., Bedford. The showcase will feature the premiere of the one-act plays that won first and second place in the annual playwriting competition hosted by Off Pitt Street. Highlights from the third-place entry also will be featured. The showcase is recommended for anyone ages 14 and older. Tickets are $15 for adults and $10 for students and seniors. Make reservations by calling or texting 310-1987, e-mailing info@offpittstreet.com or visiting www.offpittstreet.com. Anyone ages 21 and older may bring their own beverages. An annual cleanup is scheduled. The 18th annual Bobs Creek Spring Cleanup will be held March 30 from 8 a.m. to noon. Participants should meet at the pull-off along Route 869, between Weyant and Pavia, at 8 a.m. Email jimmarla@embarqmail.com to register or call 285-7741. The annual event is sponsored by Bob’s Creek Stream Guardians and Pavia Sportsmen’s; Pavia, King, Lincoln and East St. Clair townships; Keep Bedford County Beautiful; Blue Knob State Park; and the Great American Cleanup of Pennsylvania. Wear boots or water shoes and dress appropriately. Crissey, Christopher L., 41, of West Salem, Ohio. Fetter, Barbara E., 65, of Bedford. Musselman, Ethel S., 100, of Bedford, died Wednesday at home. Obituary will appear in a future edition of the Gazette. Arrangements by Leslie-Miller Funeral Home Claysburg. Seth, Danielle Nicole, 30, of Johnstown. Weitzel, Randall Gene, 68, of Bedford.